Gain invaluable insight from world-class photographers. Choose from over 18 educational workshops and intimate hands-on labs led by top talent in the photography & imaging industry. Also, don’t miss presentations from TY Bello, Chellah Tukuta, Seun Akisanmi, Emmanuel Bright, Adedamola Oyeneyin & others. Please note that most specialized session has a class-size limit and registration will close once the class is full. It is important therefore to register early and plan to arrive at the venue ON TIME as all sessions will start promptly. 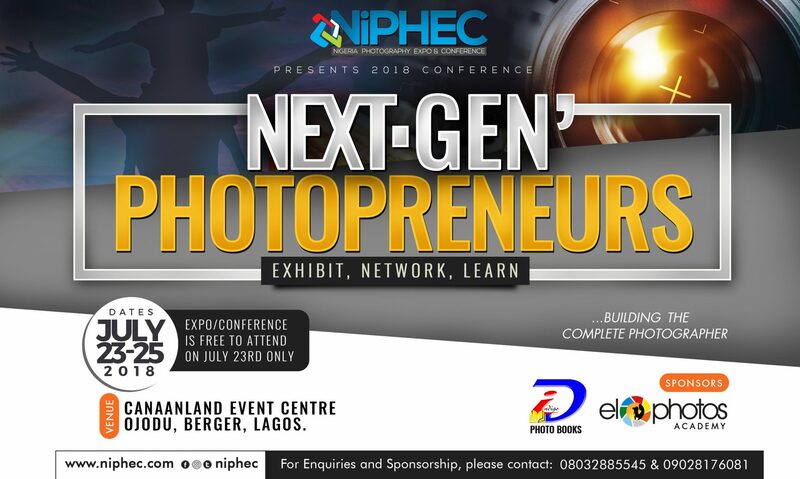 This year’s edition of NiPHEC will take place mainly in Lagos (July 23 – 25, 2018), with a few classes happening in Abuja on July 26, 2018. Feel free to contact us at info@niphec.com or 08120129149 or 08032885545 if you have any questions. Listed below are the details of the seminars that will hold during this monumental event. Feel free to print this out and decide the sessions you’ll be attending. Once you’ve decided the seminars you’ll be attending, calculate the total cost implication, make payment into our bank account (Diamond Bank account number 0060967085, Nigeria Photography Expo & Conference Enterprises) and proceed to fill out the REGISTRATION FORM. Note that you can also make internet/online transfers into the account listed above. Please endeavor not to make any payments into any other account apart from the one listed above. It is paramount that you fill the form within 24 hours of making payment so as to secure your seat in the class. Please kindly contact us to confirm availability of space if registering after July 9. Once there are fewer than 5 spaces left for any sessions, the corresponding class will be adjusted to reflect the remaining seats. Understand also that it is inevitable that some sessions might clash with others. The first 4 letters of each seminar (e.g. NOCA, WASA or PBML) is the code you will be using to register for each class. Once each class is full, we will be closing registration for that particular class. Although seminar fees are non-refundable, you can swap classes with the same course fee not later than July 11. Swapping of classes will not be permitted after this date, so we’ll appreciate it if you choose carefully. For now we’re unsure of the availability of sales of DVD packs for classes but indicating your interest will help us consider it if we get enough orders. 7:30am – 9am: Registration Opens. 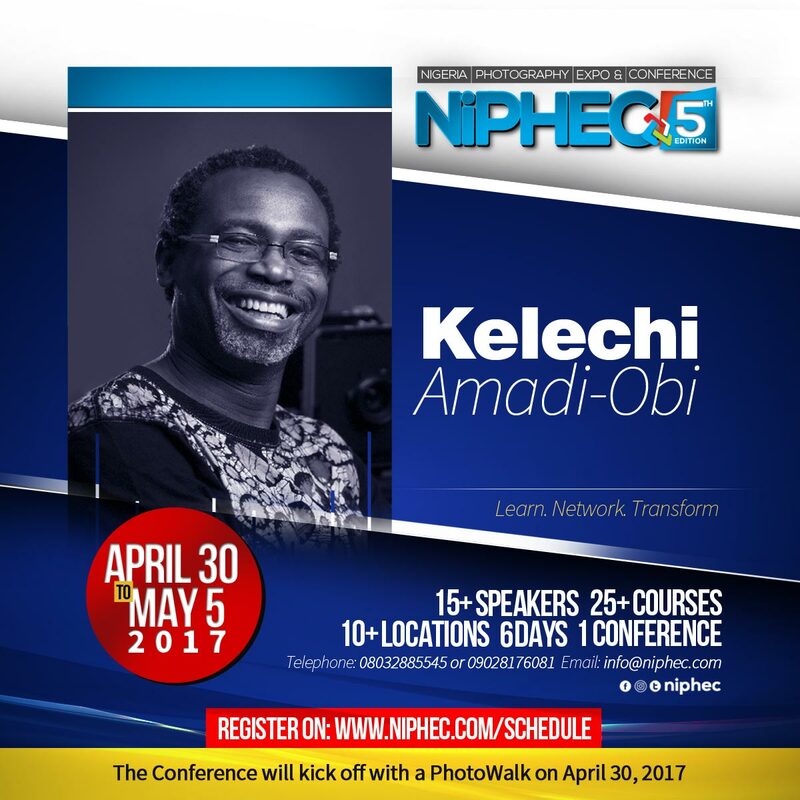 MLPF: A Masterclass on Lighting for Portrait & Fashion Photography by Kelechi Amadi-Obi. In this 6 hours workshop, award-winning fashion photographer, Kelechi will take participants through practical steps to creating some of the iconic pictures he has done over the years. It will be an interactive session of 20 participants that will entail a mentoring session beyond the workshop. Creating a photography website = N10,000. The Art of visual storytelling by Andrew Esiebo = N5,000. Using social media to effectively market your photography by Abayomi = N2,000. Starting a fulfilling career in photography by Seun Akisanmi = N3,000. Understanding parts and functions of a DSLR = N5,000. Off camera lighting using speedlight by Damelle = N6,000. A professional guide to covering events by Seun Akisanmi = N5,000. The ART of the ART by Deola Gold and Uche James Iruoha = N10,000. Creating a compelling photography brand by Emma Bright = N6,000. The photographer’s Eye by KAO = N10,000. Shooting professional videos with a DSLR = N8,000. The smartphone photographer: maximizing the photography potentials of your smartphone by Sunday = N5,000. New Born, Maternity and Child photography 101 = N20,000. Multiple streams beyond photography = N5,000. Retouching skills for portrait photographers by = N8,000. Creating stunning portraits = N7,000. (LAGOS; Dmayo, ABUJA; The throne guy). Photography as a medium for social change by Seun Akisanmi. Cinematography for wedding by Lanre Esho = N40,950. Fashion photographers 101 = N45,000. 360 degree photography = N20,000. Shooting without a camera by Opeyemi = N2,000. The artist guide to social media by Maraji, Woli Arole, Lasisi Elenu, Craze crown. PTPP: Posing Techniques for Portrait Photographers by Femi Coker. This course entails: Fundamental posing techniques, creative posing ideas, tips and tricks, Concept of flow posing, Understanding Lighting and Posing, How to have fun while posing your client. BASP: Introduction to the Basics of Photography by Tosin Bakre. At the end of this session, you would have learnt how to: handle your camera better, understand the exposure triangle and how to manipulate it to your advantage and how to take creative sharp pictures. Coming along with your camera would be an advantage. MSIP Multiple streams of income for photographers by Seun Akisanmi. Learn other source of income in photography aside clicking the shutter buttons. And ultimately maximise all potential arms of photography. Fee: N15,000 (only 20 participants). Class Objective is to have good knowledge of lighting and how to manipulate different light source. This class covers major aspects of wedding photography, from getting the job to taking the right shots to marketing your work, and making a profit-while keeping everyone happy along the way. Learn the business of wedding photography from two of the top professionals in the industry. VPUD: Videography and Photography Using Drones by Bolaji Zealet. This 4 hour class will to train on photography and drones, regulations, Safety and Precautions, Commercial aspect of drone business, Flight training, Basic control, Orientation Maintenance, Basic flight techniques, Settings and Configuration, Pictures settings, How to capture best photo, Video settings, Pre-flight checklists, Compass calibration, Take off and hover check and landing. For 15 participants with laptops. Learn how to Shoot, Process and Render Timelapse Movies. An Ideal for real estate professionals, decorators, event planners and photographers who wish to stand out of the crowd. This class is designed for those with a foundational knowledge of the basic use of a DSLR. Many Photographers are yet to harness the full potentials of their speedlites (external flash). This class will help you unlock those speedlites potentials. Coming with your gear especially speedlites, triggers and all accessories will help your learning process. Fee: N12,000 Class size of 20 participants. Must have a laptop. Fee: N10,000 Class size of 20 participants. Participants will be learning; light set up for portrait: Four Studio Light Setup (Feather lighting, Split light set up, Clamp-shell light setup, Butterfly light setup), the use of gels to create a colourful effect in our portrait lighting, the use one light and reflector to create awesome dramatic portrait. Participant will understand what is required to create beautiful portrait, have updated knowledge on different types of light setup, understand what type of light setup that is required for a specific photo-shoot, understand how to manipulate light to create beautiful images, understand the power of team work (Model, make-up artist, stylist etc) to achieve outstanding result in creating great works. BPED: Basic Photography tips for event planners, decorators & cake makers by Mosope Onanusi & Olajumoke Sanni. Fee: N10,000 Class size of 30 participants. SYPO: Selling Your Photographs Online by Ayo Ogidan & Seun Akisanmi . Participants will be able to understand the importance of child and maternity photography, understand the risk of being a child and maternity photographer and know how to photograph children and maternity. Maximum class size of 15 participants. 2) 10-day Intensive Training: A 60-hour+ intensive training, this program is designed for busy people who want to get a quick solid foundation of different basic aspects of photography. Below is a breakdown of some of the courses (we call them modules) we offer in this program.